Baskets in Bloom Collection by Gail Pan for Red Rooster. 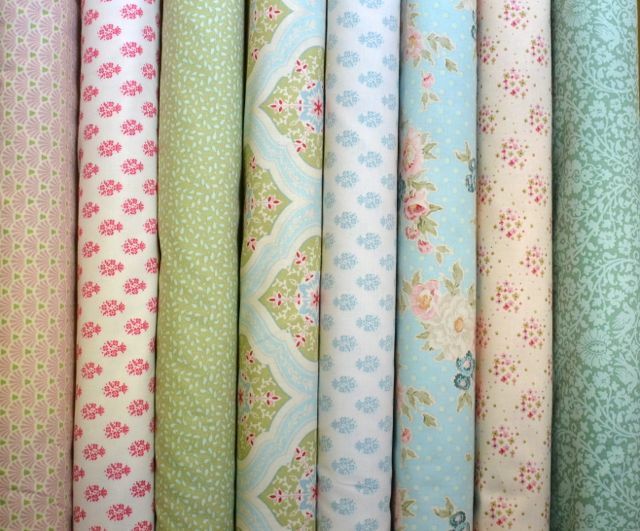 Lovely new Tilda fabrics available today! 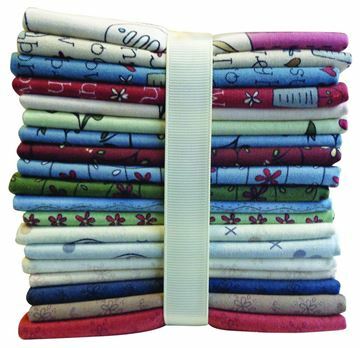 Panel and Fat Quarter Bundles on Sale! The Nice People Nice Things collection by author and award-winning machine quilter, Helen Stubbings, celebrates family, friends, and lots of our favorite things. There’s a playful panel with images of nice people and nice things set on a red text ground. On the panel are pictured Grandma and Grandpa, two very nice people. 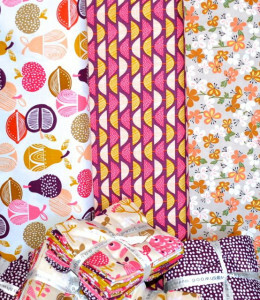 They’re joined by sisters and friends, who all love nice things, like quilts, pink lemonade, and dessert! With twenty-eight framed images to choose from, there’s something nice on this panel for everyone! Just select the people and things that are meaningful for you to use in your projects. Seven coordinating designs include a playful toss of the images from the panel, rows of hearts, lace-edged dots, a berry texture, a checkerboard, and a lacey stripe. 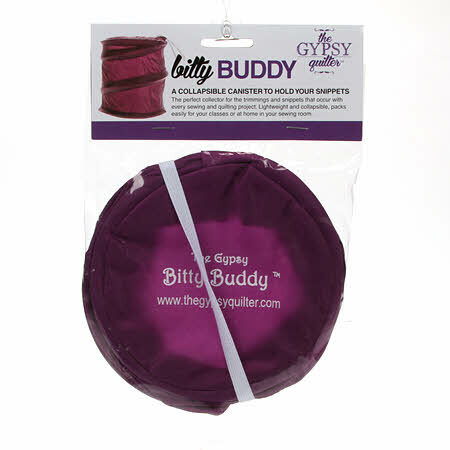 A text print carries warm sayings like “You’re my cup of tea” and wise words of advice like “Life is uncertain, eat dessert first.” A meandering running stitch appears in many of the prints, inviting hand stitching and embellishing with buttons and beads. Make a quick pillowcase to feature the panel, or simply border the panel with the stripe and the dots for a quick lap-size quilt! 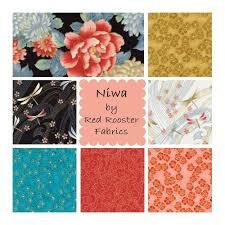 Niwa is the newest Asian collection from Red Rooster Fabrics’ Studio. 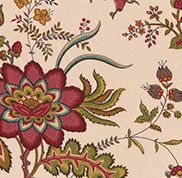 It features sprays of peonies, chrysanthemums, primroses, and plum blossoms with butterflies and delicate dragonflies on a textured black ground. 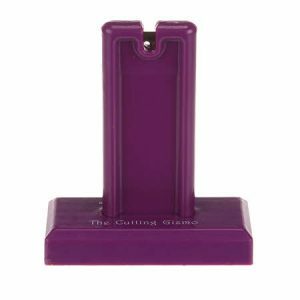 Life-size peonies and chrysanthemums, a floral toss with fans, dragonflies in the breeze, a butterfly toss, and sweet tone-on-tone primroses complete this lovely collection. Gold metallic accents add a touch of elegance to the Niwa prints. They work nicely in many pieced and appliqued blocks including fans, hexagons, and clamshells, as well as in home décor projects, especially pillows and table linens, and for totes, apparel, and accessories. 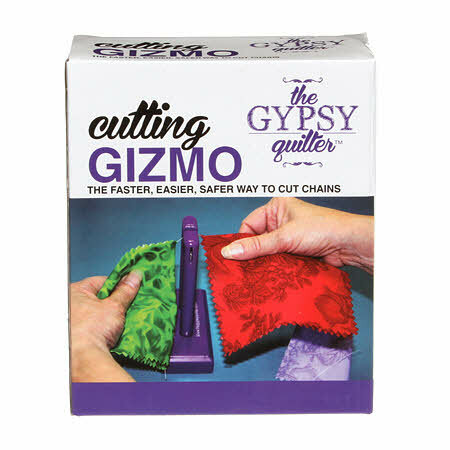 Some great new products from the Gypsy Quilter have arrived! 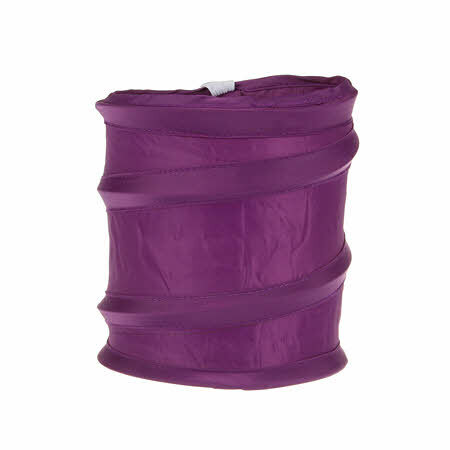 while improving consistency and easing construction. 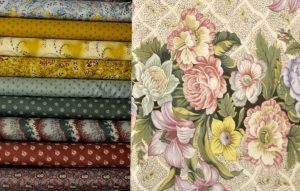 These fabrics by Petra Prins and Nel Kooiman are inspired by Seventeenth & Eighteenth Century hand painted textiles from India often known as “chintz”. 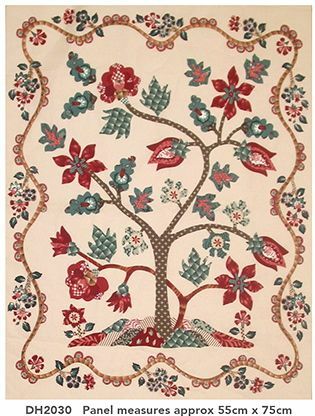 Di Ford has designed the ‘Tree of Life’ panel for those of you who want a quick quilt, add some borders and it will look stunning. 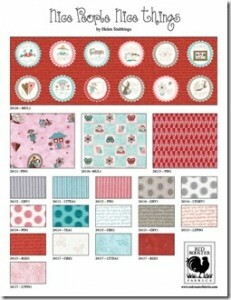 A wonderful new range, ‘Serenata’ by Samantha Walker has arrived this week. Beautiful florals and contemporary patterns in teals and greys with a touch of yellow. 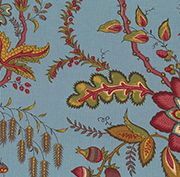 A gorgeous peacock can be found amongst the flowers. 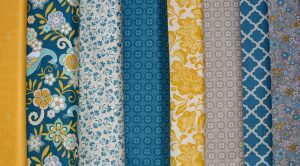 I have teamed up a few of my favorites yellows from the store to finish off the perfect fabric packs. 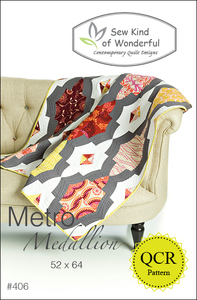 Jenny Pedigo and Helen Robinson’s new book: “Contemporary Curved Quilts” has arrived! 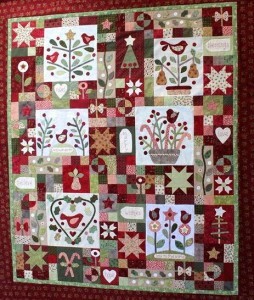 I love simple applique and I love Christmas. 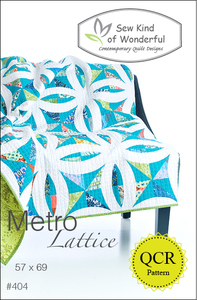 This is one quilt I want to make for myself! 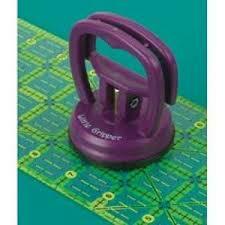 Cost is $35 per month plus postage. 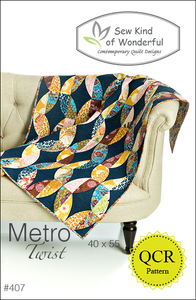 If you can’t wait for each month buy all the patterns and fabrics in one hit for $200.00 plus postage. 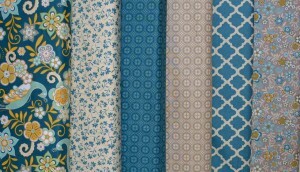 New in store are some of the Circa 1825 fabrics by Sharon and Jason Yenter. 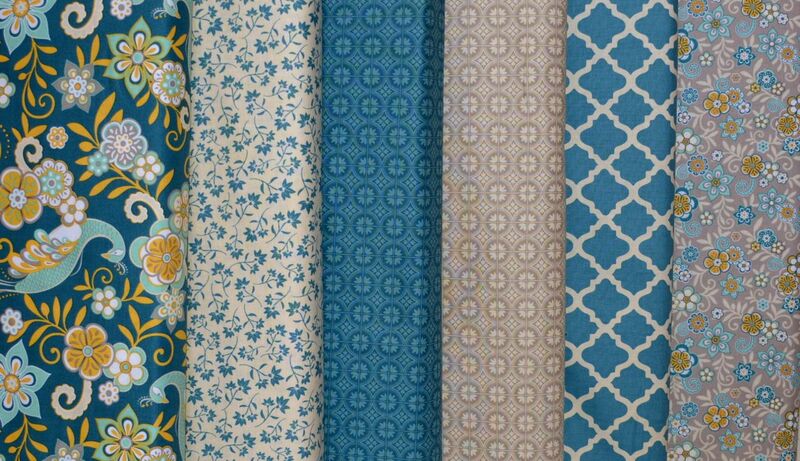 Inspired by Sharon Yenter’s antique quilt from 1825, these beautiful fabrics have been meticulously reproduced. 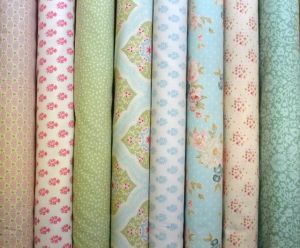 There is a beautiful border fabric with large blossoms suitable for Broderie Perse and a couple of super serpentine borders.Tone-on-tone fabrics compliment these beautifully!